In the frontal offset test, there was extensive deformation of the bodyshell. There was a rupture of the floorpan in the driver's seating position, considerable buckling of the floor in the rear of the passenger compartment and spot welds had failed at the point where the bottom sill meets the C-pillar (the rearmost pillar of the passenger compartment). The car was penalised for this and Mitsubishi were precluded from demonstrating that structures in the instrument panel, such as the steering column and column shroud, would not present a risk of injury to the knees and femurs of occupants in the front seats. Protection of the knees, femurs and pelvis was rated as marginal. There was also insufficient pressure in the airbag to prevent the driver's head from bottoming-out against the steering wheel. Dummy head readings showed that contact had been made with the steering wheel through the deflated airbag and protection of the head was downgraded to adequate. 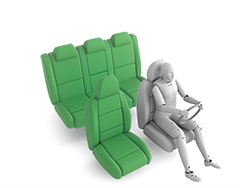 In the full width rigid barrier test, protection of the driver dummy was good for all critical body areas while, for the rear passenger, protection of the neck was adequate and that of the chest was marginal. In both side impact tests - the side barrier and more severe side pole - the L200 scored maximum points, with good protection of all critical body areas. The front seats and head restraints showed good protection against whiplash injury in the event of a rear-end collision and a geometric assessment of the rear seats also indicated good whiplash protection. 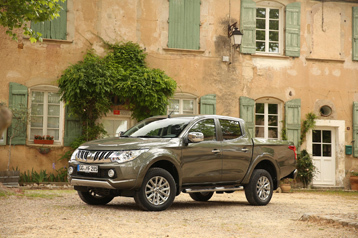 The L200 does not have an autonomous emergency braking system to assist further in whiplash protection. In the dynamic impact tests, the L200 provided good protection to the child dummies in all areas except the chest, with both dummies showing marginally elevated chest decelerations. In the frontal impact, forward movement of the 3 year dummy, sat in a forward-facing restraint, was not excessive and, in the side impact, both dummies were properly contained within the protective shells of the their restraints, minimising the likelihood of head contact with parts of the vehicle interior. 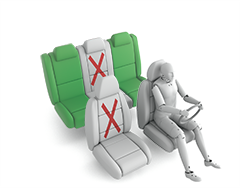 The front passenger airbag can be disabled to allow a rearward-facing child restraint to be used in this seating position. Clear information is provided to the driver regarding the status of the airbag and the system was rewarded. All of the restraint types for which the L200 is designed could be properly installed and accommodated in the vehicle. Protection of pedestrians' legs was good and the L200 scored maximum points in all areas tested. However, the protection offered to the pelvis was mixed, with areas of good, adequate and poor performance. The protection offered by the bonnet to the head of a struck pedestrian was predominantly good or adequate, with only a few poor results at the front and rear edges. Electronic stability control is standard equipment, together with a seatbelt reminder for the front and rear seats. A driver-set speed limiter is standard on all variants while a lane departure warning system is an option, expected to be widely fitted. There is no autonomous emergency braking system on the L200. The double cab variant tested is the one most likely to be bought as family transport. Other variants are available - single cab and crew cab - which are intended primarily as cargo vehicles and have a lower level of safety equipment. The rating indicated here applies only to the double cab variant with the specification indicated.